Is Summer actually here!? Having just returned from a rather chilly trip to South America, London honestly feels so warm to me! I’m sure it will wear off, but for now I wanted to share a beautiful hidden gem of a place that would be perfect for a sunny summer’s lunch. Let me introduce Skip Garden in Kings Cross! Skip Garden lies about 5 minutes back from Kings Cross station, just by the likes of Dishoom, Caravan and the Grain Store. It is a little calm oasis in the middle of London’s hustle and bustle. This sustainable urban garden is filled with wild flowers, vegetables and herbs, beehives and chicken coops. Everything you see has been built using recycled materials. It started as a movable garden built in skips, but is now a wonderful community project. How did I find this hidden gem? My friend works just around the corner and had walked past it but never entered so suggested we give it a try. I’m so glad we did! On the day we went it was pretty cold and windy so had to sit inside. It’s quite tiny inside but oh so cute. But as you can imagine there is a load of space to sit outside and enjoy the sun on those lucky days. 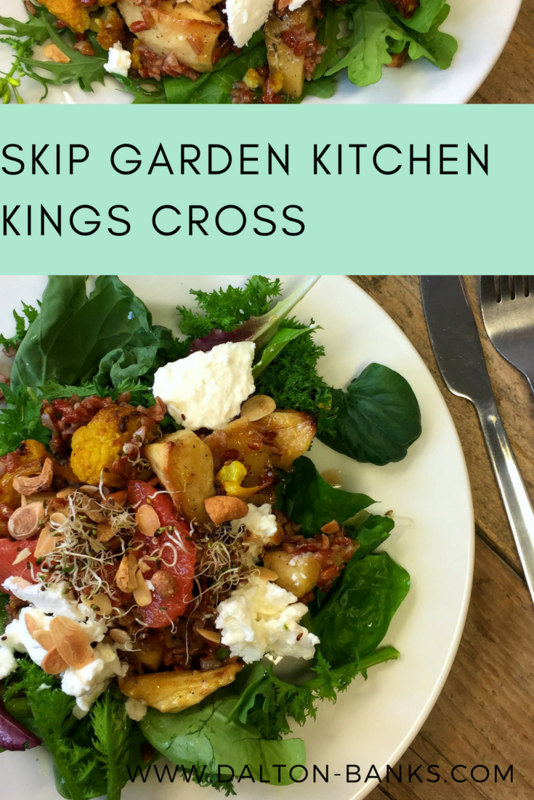 The Skip Garden Kitchen serves beautiful, simple food that is grown in their garden. 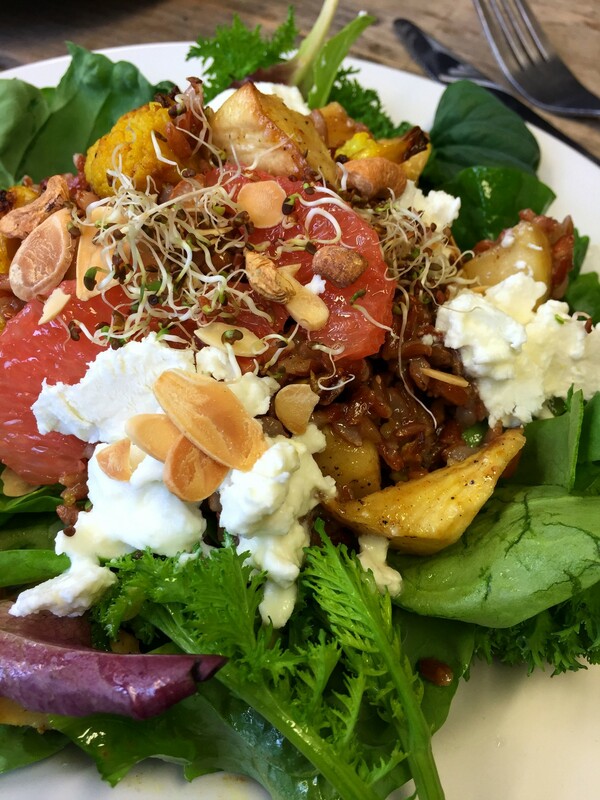 Fresh, vibrant salads, hearty soups and some damn fine homemade cakes fill the menu. 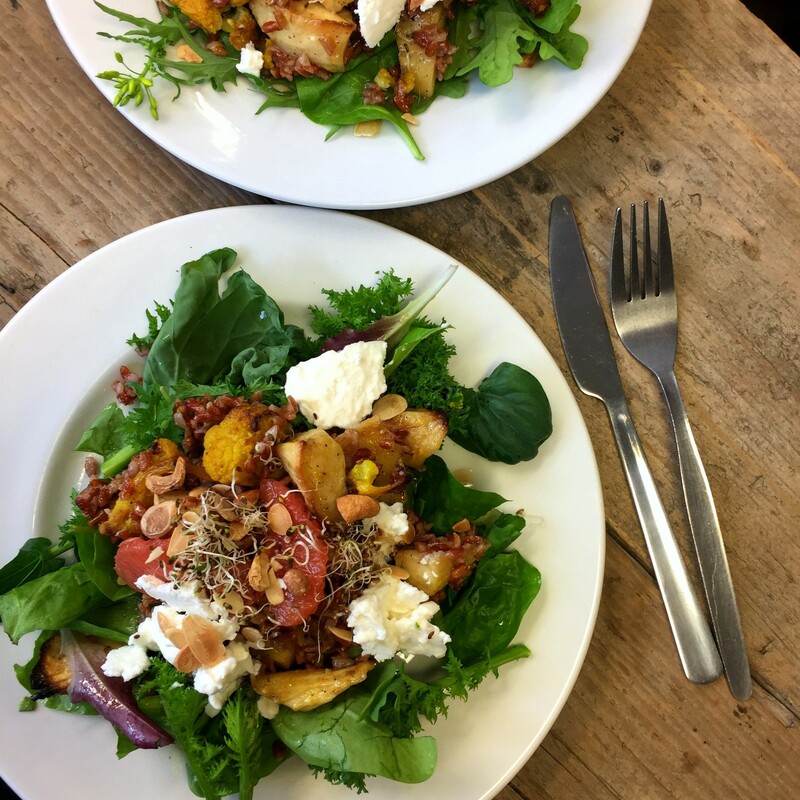 We ordered the Super Salad: a variety of green leaves freshly picked from the garden topped with roasted parsnip and cauliflower with red rice, almonds, grapefruit and feta. What a salad! The roasted vegetables gave it great substance meaning I actually felt full. And the salty feta is the perfect partner for the juicy grapefruit. Wonderful ingredients create wonderful salads. We didn’t have time for cake. I won’t make that mistake again. Next time I’m going all in – salad, cakes and coffees whilst I sit in the sun and watch the world go by from this little haven. Skip Garden Kitchen is open Tuesdays to Saturdays, 10am-4pm, serving homemade cakes, teas and coffees, with lunch from 12-2pm. Do you have a hidden gem in London that you love? Such a hotspot, but this is definitely a hidden little gem. I know, what was I thinking. There should always be time for cake! Oh, I’ll definitely be visiting. Sounds like my type of place! You should, especially as it’s not overpriced as other places in the area are. Let me know if you go! Aaron having lived in East London for many years I’ve never been to Roving Cafe! So thank YOU! I’ll definitely be popping in next time I’m close by!